time feeding for egg production and may only visit the nest to lay. 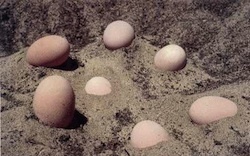 Early in the breeding season the heat for incubation of the eggs is produced by decomposition of the litter, but late in the season, heat from the sun is also utilised. The main function of the litter incorporated into the mound is to enable the birds an early start to egg laying. laying season, which is thought to depend on food supply and the onset of very hot weather. 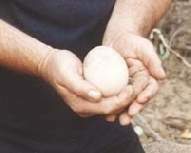 Egg size has been shown to be related to the survivorship of chicks, and also varies substantially (up to 15%) between years. The availability of food and water balance are likely causes for this variation in mean egg sizes in populations. Chicks typically begin hatching and emerging from mounds in November, and although hatching may continue until March in some seasons, most chicks usually emerge from mounds before January. Chicks hatch, buried with up to a metre of sand and leaf litter above them, and their unaided struggle to the surface may take up to 15 hours. The chicks receive no parental care after hatching, but can run and feed themselves almost immediately and fly within a day. Mortality of chicks is very high over the first few weeks after hatching. About 80% of the chicks die within the first ten days, most chicks succumbing to predators or metabolic stresses such as starvation. Thereafter, mortality declines but is still high. In captivity, Malleefowl reach breeding age at 3-4 years. Once birds reach breeding age, they are long-lived. During a radio-tracking study in Victoria, several Malleefowl were monitored for a cumulative total of over 20 years during which time most birds were subjected to a fire, followed by a severe six month drought, yet only two deaths were recorded (Benshemesh 1992a). In captivity, a male of at least 19 years old was still breeding in 1998 at the Adelaide Zoo (M Johnson and M Craig pers. comnl). A recognisable pair of Malleefowl at the Little Desert in Victoria was known to breed for 25 years before one of the pair disappeared (K Hately pers. comm.). Also at the Little Desert, an unbanded pair has been known for 17 years and both the male and female were still breeding in 1997 although they have found other mates and no longer breed together (W Reichelt pers. comm.). Measuring the recruitment of young into the adult population is made difficult by the very high mortality of chicks and the long period of time before survivors may appear in the breeding population. This high mortality of chicks is not surprising considering the harshness of the arid and semi-arid environment during summer and autumn, the lack of parental care, and the longevity of adult Malleefowl. On average, a pair of Malleefowl may produce hundreds of chicks in a lifetime, but require only two chicks to survive to breeding age to sustain a stable population. What proportion of chicks must survive to sustain a population is not known but is likely to be about 2% assuming an average breeding life of ten years in the wild. 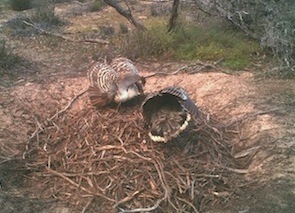 Malleefowl are generalist feeders. Various reports and studies have described the diet of Malleefowl as consisting of the seeds, flowers and fruits of shrubs (especially legumes), herbs, invertebrates, tubers and fungi. These studies, and the differences between them, indicate that Malleefowl diet is characteristically variable and that different foods are important at different times and locations. For example the diet of adults throughout the year is mostly seeds and fruits of shrubs, particularly of acacias. Seeds from introduced herbs and crops have been predominant in the summer in other studies, and herbs are predominant through the cooler months of the year. In habitats bordering croplands, Malleefowl are often observed feeding on fallen grain at the edges of uncleared habitat and up to 100 m or so into cropland and these foods may be crucial to the existence of the birds in small reserves. In general, the diet of chicks is thought to be similar to that of adults, although observations have been mostly restricted to summer. During this time, chicks have been observed to eat insects and the seeds from both shrubs and herbs. In particular, a diversity of food shrubs, rather than abundance of any one species, has been suggested as critical to ensure continuity of food for the birds during lean times such as droughts. Studies show that Malleefowl are more abundant in areas where shrubs are more diverse. A regular supply of food throughout the year is clearly important for the birds' persistence in an area. Occasional super-abundance of foods benefit the survival of chicks and may be important for recruitment of young into the adult population.